Our multi-specialty team includes a chiropractor, a medical doctor, and physical rehab to provide you with a highly effective, non-surgical approach to your pain or injury. We can get you out of pain and on with the life you really want to live - one that is vibrant and not controlled by pain and inflammation. We are committed to services that restore your health and promote your overall well-being. We specialize in the treatment of neck pain, back pain, headaches, disc problems, arthritis, inflammation and more. Your spinal health affects so many other functions in your body and people often notice that even simple tasks are difficult when their spine has been injured or is chronically under trauma. That's where our chiropractor can help you feel better than you even knew you could! The older we get, the tougher it is to lose weight. We take a holistic approach to weight loss, just like everything else we do. The non-invasive laser lipo creates a warm light that superficially penetrates the skin and stimulates fat cells. Our Chiropractors and staff will explain our findings, and how it is that we will treat them. We will educate you about your body, how it works, and how to continue to get the relief you need. We work as a team to provide the best in physical medicine and chiropractic services—all in one Certified DME center. We offer weight loss options to our patients and are proud to offer Lipo Laser Therapy to help patients lose weight quickly and safely. 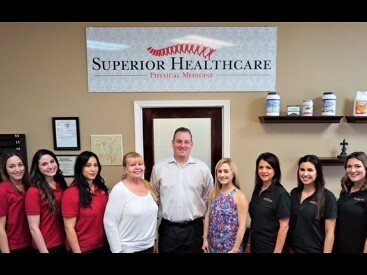 At Superior Healthcare in Metairie, LA, our chiropractic health center works as a wellness team to provide the best in physical medicine and chiropractic services — all in one certified DME center. That means you feel better quickly because of access to the latest and most scientific methods of healing administered by a chiropractic physician and supporting medical staff. The patients at our chiropractic health center trust us to provide relief for all kinds of pain, assist with weight loss, and to get to the root source of whatever condition is preventing them from living life to the fullest. We treat the cause of your health concerns so symptoms aren’t just masked, they are eliminated entirely. Even if you’ve tried other chiropractic physicians or other types of doctors in the past, try us. We want to show you how our chiropractic health center in Metairie can help you become a happier, healthier, more confident version of yourself.